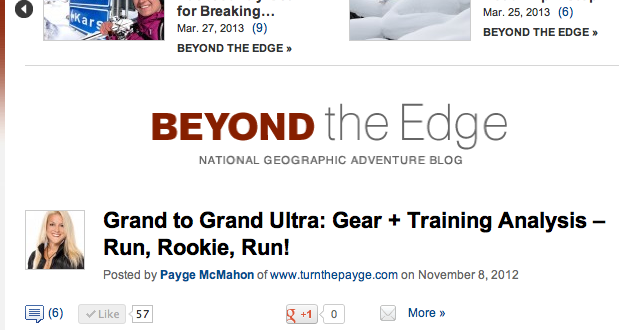 Payge McMahon writes the follow-up article, for National Geographic Adventure, on her experience competing in the 167-mile, Grand to Grand Ultra. Titled, 'Run, Rookie, Run!' find out the good, the bad and the ugly, how she would train differently and what kind of gear she would swap. Lots of lessons were learned. She is already planning a big adventure in 2013 to implement her new found wisdom. Find out what McMahon had to say in this enlightening, fun article in National Geographic Adventure.